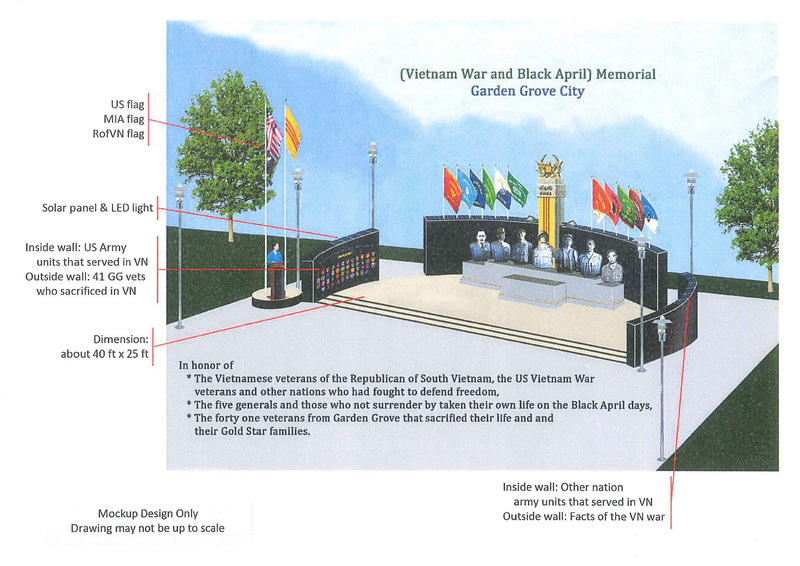 MOCKUP of the proposed Vietnam War and Black April Memorial (City of Garden Grove). Work toward the proposed “Black April Vietnam War” memorial inched forward at Tuesday’s meeting of the Garden Grove City Council after a lengthy discussion. A motion by Councilman Phat Bui to devote 20 hours of city staff time to examine the feasibility of placing the planned 40-foot by 25-foot memorial at the north end of Garden Grove Park was approved on a 4-1 vote with Councilman Kris Beard opposed. That motion followed the defeat of a substitute motion by Beard to instead refer the matter to the city’s Parks, Recreation and Arts Commission to create policies and procedures for memorials. Councilmen Steve Jones, Bui and Phan voted against it, with Beard in favor and Mayor Bao Nguyen abstaining. In the public comments segment of the meeting, three people spoke in opposition to the project, which would observe the fall of the South Vietnamese government to Communist forces in April 1975. The memorial, as envisioned by Bui, would single out five South Vietnamese generals and two colonels who committed suicide rather than surrender to the North Vietnamese Army. 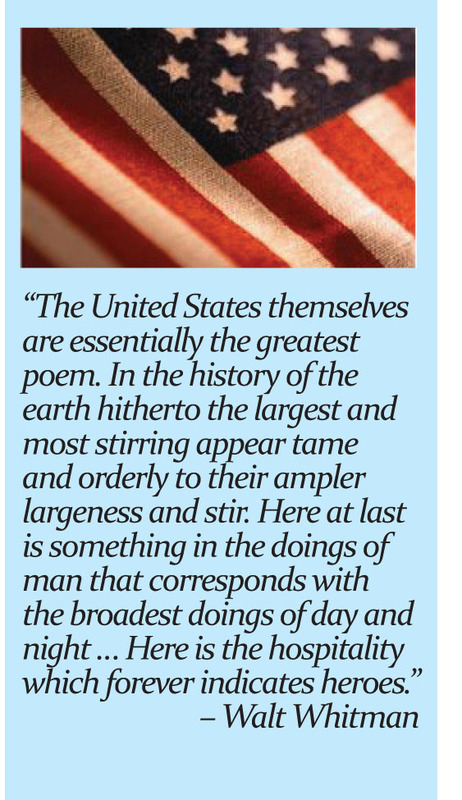 Peter Katz, a military veteran, called the idea “a personal affront” and argued that instead, money and effort should be made toward providing more assistance to veterans of the Vietnam and other wars. Charles Mitchell, also a veteran, complained that the memorial would be focused on “one culture” and asked why there were no similar remembrances of the bombing of Pearl Harbor in 1941. On the other side four speakers supported the project, their comments backed up by Bui, who told the story of his own family’s escape from Vietnam as military resistance collapsed. Recalling how his family had fled from North Vietnam to the south in 1954 when the country was partitioned between communist and non-communist governments, he recalled thinking “We thought the world was coming to an end” as communist forces advanced and Republic of Vietnam resistance crumbled. Bui emphasized that his ideas were only an “initial proposal,” subject to change. He added that the memorial, which included a stage and a lectern, could be used for other purposes as well, including concerts in the park. Bui added that the project – which could cost several hundred thousand dollars to design and build – would be “self-funded” by private donations, and the upkeep would also be provided by contributions. His substitute motion to refer the matter to the parks commission was seconded by Phan, but after another extended discussion, Phan voted against the motion. 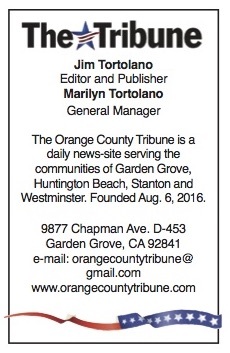 Also Tuesday night, a proposal to place on the next city council agenda consideration of participation in federally-approved cannabis/marijuana research project which would have allowed Garden Grove to grow the plant for use in studying its medicinal qualities failed when Nguyen’s motion died for the lack of a second.